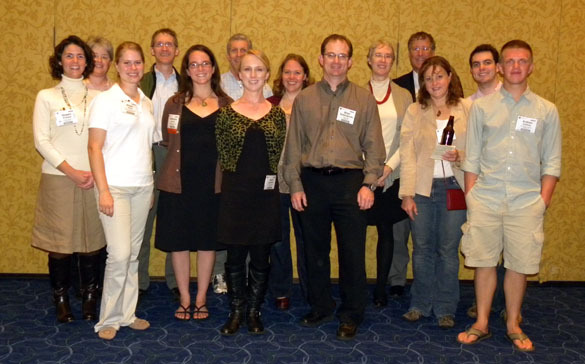 MINNEAPOLIS, MINNESOTA–It is a tradition that Wooster geology alumni, faculty, students and friends gather at the Geological Society of America meeting on Monday evening. Twenty-three of us were there tonight, although we never seem to get everyone in the same place at the same time for the photograph. It’s interesting how we actually talk very little about past Wooster experiences. Most of the time we’re comparing notes about our current projects and planning when we will see each other again. That and apologizing for missing each other’s talks!